Just about anyone who has tried snorkeling yearns for a deeper look into all the underwater world has to offer. 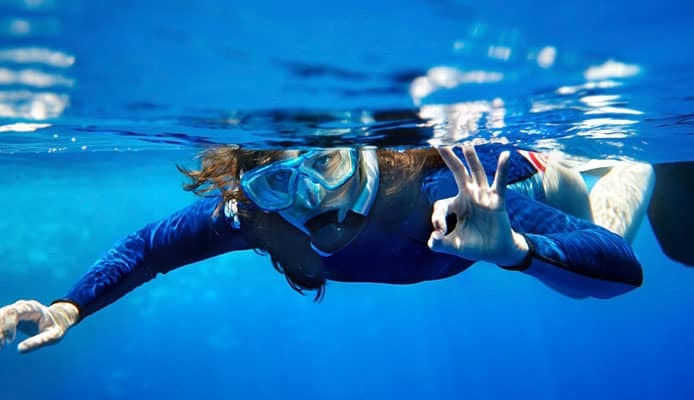 Breathing underwater and a taste of the mermaid life may seem like a great adventure, however going down into the depths of the water may be a more complicated experience. For some this starts with the claustrophobic feel of putting on a wet, or even dry suit. For others it is the moment they go underwater and have to take their first breath. Trust us when we say breathing underwater is anything but a natural feeling. When enrolling in your first scuba diving course, most people have no idea what to expect. That is why we have written down some basics to have you feeling more prepared. 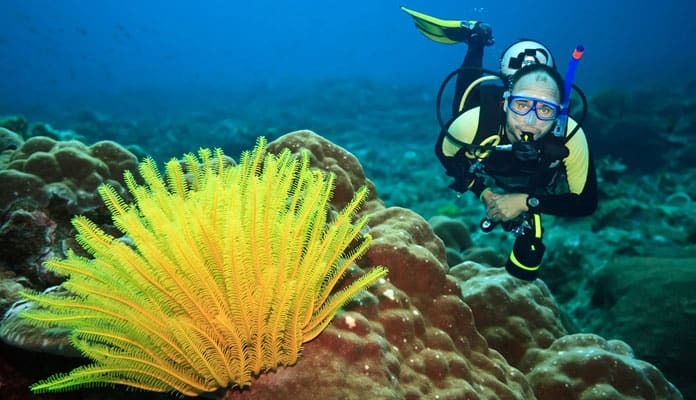 As a new scuba diver, your dive shop will typically include a full set of scuba gear. This will seem incredibly heavy and quite possibly even claustrophobic. Your first lesson will be in a controlled site. This will typically be a pool or another site where you can stand up if needed. Here is where you will work closely with your dive instructor to learn how your dive gear works and all about the different safety techniques associated with your dive. Your first lesson will typically be on the unfamiliar task of breathing through a dive regulator. Putting your face underwater and taking your first big inhale is guaranteed to be an unnerving experience. 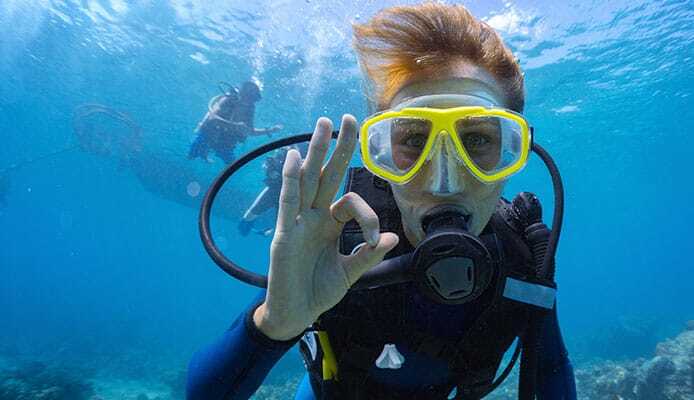 Our recommendation: put on your scuba mask and practice, practice, practice. Breathing through your regulator above water until you are comfortable with the feeling. When you are ready, lower your face into the water mid exhale. Just as you had before, take your inhale through your mouth and voila! Your are breathing underwater. Being able to get comfortable with this feeling while on your pool dive will allow you to be more relaxed on your ocean dive and therefore conserve your oxygen and allow you to dive for longer. You may think of diving underwater to be this silent, meditative experience. You may not expect that your dive, especially your first one, will be quite noisy. Breathing underwater will produce a loud bubbling noise at exhalation as well as a whoosh noise when you inhale. In the beginning, this will be a very loud sound. If you are lucky, you will also hear calls from different underwater animals including whales and dolphins. As sound waves travel more quickly in the water you will hear much more than you would above water. Your vision underwater will be much more limited than on land. The scuba mask you don during your dive will greatly limit your peripheral vision. For those who have had experience snorkeling, this may not seem as claustrophobic as it will for first time users. It will not take long for you to get used to having to turn your whole head instead of simply your eyes. Underwater, the physics of light transmission has a magnifying effect causing objects to appear about a third closer than they actually are. With time, your brain will account for this change and you won’t even notice the difference. Pro tip: this time can be sped up by teaching your brain about the underwater world. Reach out and touch things underwater. The pool wall, your leg, your dive buddy. Be sure to not touch corals, fish, or other aquatic life. 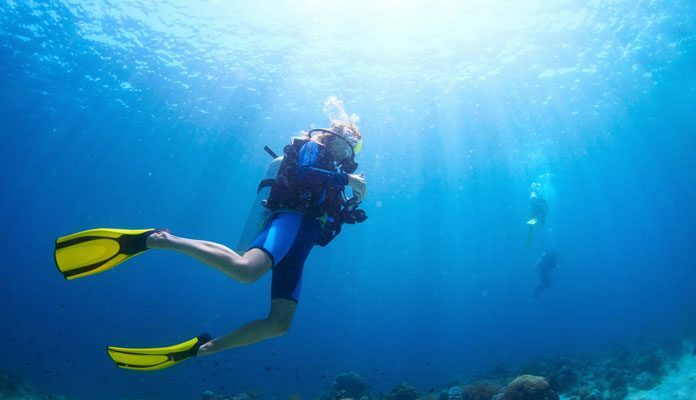 Similar to the desired weightlessness feeling you get from space, scuba diving gives you the much desired floating feeling. You are free to fly in any direction you like. It is important to embrace this feeling. Between the water and your BCD, you will have enough support to stay in position without much effort. Do not fight the water, this will only use up your oxygen faster. Moving through water will have more resistance than moving through the air above the surface. This will tire you quicker, but with the help of dive fins, you will have all the help you need to get through the water. If you are of the lucky few who have the great opportunity to see some large wildlife while underwater, embrace it! As you have an unnatural feeling underwater, to begin with, seeing a whale, turtle or even a shark may seem intimidating. Remember, you are in their habitat, not the other way around. Do not try to interfere with their life by approaching them, touching them or scaring them. The best thing you can do is stay calm and try not to thrash around. Simply enjoy the chance to view these creatures in their natural habitats. Relax and have fun! As your brain begins to work overtime trying to remember everything that you have learned underwater you may quickly get overwhelmed. Couple that with all of the new sights and sounds that are underwater and you can easily forget to enjoy your experience. Your body will react in different and unexpected ways. Submerging yourself into cold water will likely give you the unnerving desire to pee. Again, it is ok. This is a perfectly natural feeling. When you are out in the ocean, most divers simply pee in their wetsuit and go on to enjoy the rest of their dive. There is undoubtedly a lot of information to process and sometimes the simple things, such as hand signals, can get pushed to the back of your mind and easily forgotten. Just remember, you are not alone. Your dive instructor deals with newbies all the time, they expect you to forget some things. Doing your best to relax and give yourself a break will help you to see this part of the world for what it is. A largely unexplored and magical haven. Take the time to look up and take in your surroundings. 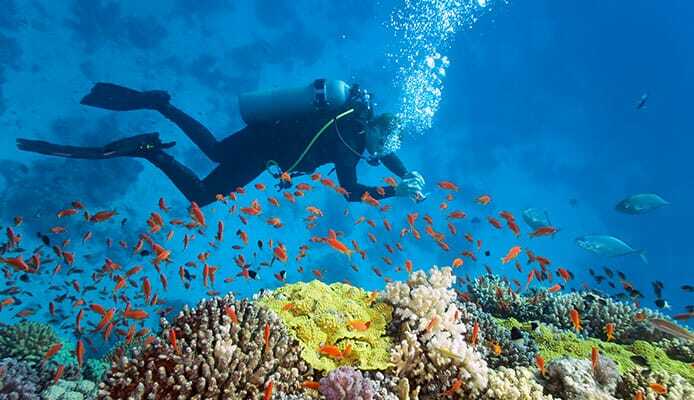 Have you tried scuba diving yet? How was your first experience? Talk to us about how you like it in the comment section below.